Courtesy of Jan Jeffries, Jr.
Jan Jeffries, Jr., is grateful that he met Mason, the stray Pit Bull he found on a jobsite. In November 2009 I was stuck on perhaps the single most miserable project of my career. I’m a construction project manager for a masonry contractor in and around Philadelphia, and this was just one of those projects that dragged on and on. I would have been pleased to never look back on it again. But then something happened that made it all worthwhile. On this particular afternoon I was in my pickup truck, leaving the jobsite for the day. From the dense, dark woods that edged the driveway came a pack of six or seven wild, ragged dogs. From the opposite direction trotted two Pit Bull Terriers: one a black, older-looking female; the other a scrawny brown-and-white male, emaciated and dragging a leash behind him. I slowed to a stop as the two groups of animals approached each other and began to fight. The two Pit Bulls, badly outnumbered, were quickly losing the battle. The smaller brown one was taking the brunt of it. I rolled down my window, honked the horn, then got out of the truck and yelled at the dogs. They scattered quickly. I’d been working in Fairmount Park for years, and although I was aware that wild packs of dogs were common in the city, I had never seen anything like this. Concerned about the well-being of the Pit Bull with the leash, I got back in my truck to follow him and try to get close enough to see if he had any tags. Perhaps someone was looking for him, I thought. I got out and approached carefully. The female growled and took a defensive, guarded posture but didn’t appear to be preparing to attack. The male only seemed curious. He allowed me to reach out and check his collar — no tags. He was bleeding in several areas, and now I could see that he was extremely skinny. The leash was tattered and looked like he had been dragging it for ages. If this dog had once had a home, he’d been gone for a very long time. Someone had probably dumped him out here and hadn’t bothered to remove the leash. 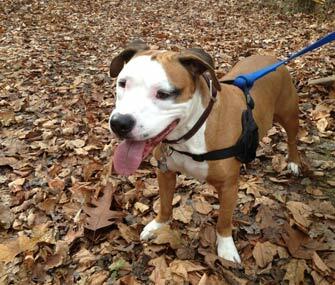 Dumping dogs in Fairmount Park is all too common. This dog had no ID and needed medical attention. I felt awful for the guy, but I had a toddler daughter, young son and two smaller dogs at home. We have almost daily visits from friends who also have young ones. I could not imagine bringing a stray Pit Bull home — I thought it would be dangerous, even irresponsible. But I didn’t want to just leave him as he was. He’d have a bit more of a fighting chance, I thought, if I removed his leash and collar and released him unencumbered. He let me take them off without any resistance. Then I said something like, “Good luck out there, fella,” and got back into my truck. Before I could settle into my seat and close the door, the dog made a sudden move. He sprang right over my lap in a single bound and into the passenger seat of my 4x4. I now had a wild Pit Bull in my truck. I quickly got out and closed the door. After a minute of bewilderment, I walked back to the jobsite and asked the foreman to come back with me and stand by, ready to help — or at least call for help — if anything happened as I tried to get the dog out of my truck. I opened the door. I grabbed the dog and pulled him out. The dog just stared up at me. His eyes begged for help. “Nope. No way! Not happening, mister,” I told him. With a heavy heart, I bade him farewell and started down the road. The inside of my truck now smelled. There was blood all over the tan leather seats, and my canvas lunchbox had been torn open. He’d ripped a bag of potato chips to shreds, and he’d devoured all my other leftovers. He was so hungry. I felt horrible.